You never hear people raving about Merlot. Perhaps that movie, you know the one I'm talking about, ruined it forever. I'm not saying Merlot is my favorite wine variety either, although I have had a couple really good Merlots this year. 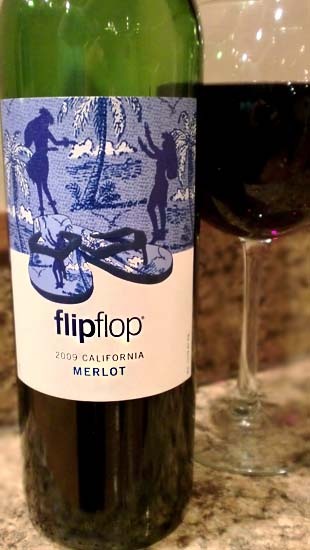 This is the 2009 Flip Flop Merlot out of California. It's another budget wine. Like $5 a bottle cheap. At that price, you can't expect too much. It pours a dark ruby red and has aromas of plums and raspberries. Tasting reveals exactly what the nose already told us: sweet plums, raspberries, and a hint of vanilla. Tannins are pretty much nonexistent. This is another cheap, simple, unoffensive wine. Drink This: if you want a simple, cheap Merlot. Don't Drink This: if you're looking for a wine with character. it’s a Chilean Merlot, not a California Merlot. It's packaged in California. FYI.